Access to energy is not secure in incredibly large parts of the world. But even where the infrastructure is available, network stability is at risk, especially in times of global connectivity and digitalization. 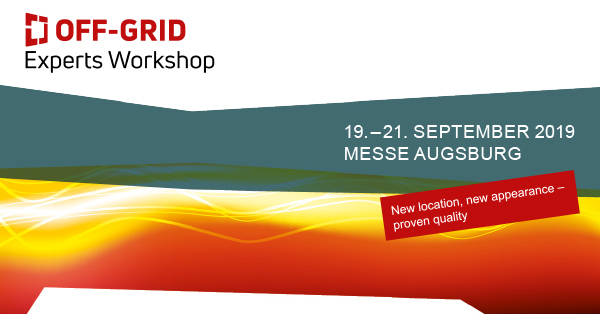 Therefore, the motto of this year's OFF-GRID Experts Workshop is: Get rid of the grid! Off-grid solutions not only create secure, but also clean and affordable energy access. This makes off-grid an interesting and highly relevant technology in all parts of the world. Call for Paper - Apply with your presentation! The two-day workshop offers experts and participants the opportunity to exchange ideas on practical solutions, application examples and innovations on the current topics of off-grid technology. Apply until 31 March 2019 with your exciting lecture and stimulate discussions with your contribution! Use the Tech-Day on 19.09.2019 for your product training! The 3rd Tech-Day, which takes place on 19 September 2019 as part of the OEW 2019, offers exhibiting companies the additional opportunity to conduct product trainings for a specific group of participants on the previous day. Book your time window now and take the opportunity to train your (future) customers in a practical way! The registration deadline is 15 April 2019 - the slots will be allocated according to the principle "first come - first served".